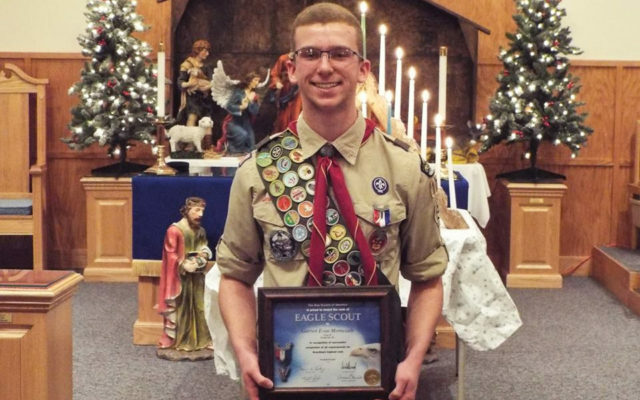 Garrett Morneault recently became the latest Presque Isle Boy Scout to become an Eagle Scout. PRESQUE ISLE, Maine — Garrett Morneault recently became the latest Presque Isle Boy Scout to become an Eagle Scout. Morneault, the son of Jeff and Regina Morneault of Mapleton, received his Eagle Award in a ceremony held Dec. 9, 2018, at the Grant Memorial United Methodist Church. The Eagle Scout Award is the highest rank in Boy Scouting. A Scout has to complete 21 merit badges, 13 of which are required, and must serve in a leadership position in the troop for six months or more. In addition, each candidate plans and carries out an Eagle Scout service project. For his service project, Morneault painted the porch and shed at the Presque Isle Historical Society’s Vera Estey House Museum. Working in conjunction with the society, he also replaced the floor of the potting shed and installed some vinyl fencing around part of the property. Morneault completed 10 more merit badges than required, earning a Bronze Palm and a Gold Palm with his Eagle Scout Award. At the ceremony, he received a certificate from Vaughn Hardacker of the U.S. Marine Corps League. He received congratulations from Katahdin Area Council representatives Scott Harvey, Scout executive; Steve Hughes, district executive; and Dave Berry Sr., district commissioner.